New York: George F. Cooledge & Bros., [1850s]. 12mo (19.2 cm, 7.5"). 48 pp. ; illus. This is the "pictorial edition of Webster's Elementary Spelling Book." 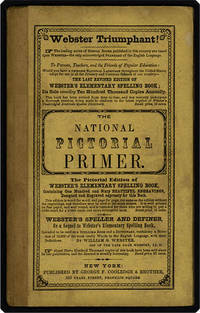 The wood-engraved frontispiece, title-page vignette, and "more than 150" engravings throughout the volume are by Tompkins Harrison Matteson (1813–84) and engraved by Alexander Anderson (1775–1870). Hamilton says that at least five of the wood engravings were designed by William P. Morgan (p. 12, 23, 38, 43, 48). The engravings are richly produced and richly various, portraying as they do contemporary American home, commercial, and farm scenes, "exotic" places, modes of transportation both quaint and up to date, children's seasonal games and pastimes, arresting moral and cautionary tales (with emphasis on temperance), and an abundance of lively animals including a whole alphabet of birds — not to mention vivid images of "whale-fishery," ballooning, and "William Penn & the Indians."